It didn’t quite reach The Lion King’s level of box office success, but since hitting theaters way back in 1999, Brad Bird’s The Iron Giant has gone on to become a much-loved classic film. So much so that it’s about time Lego gave us an official The Iron Giant set, and it just might happen if Brett Cuviello gets enough supporters for his new Lego Ideas project. 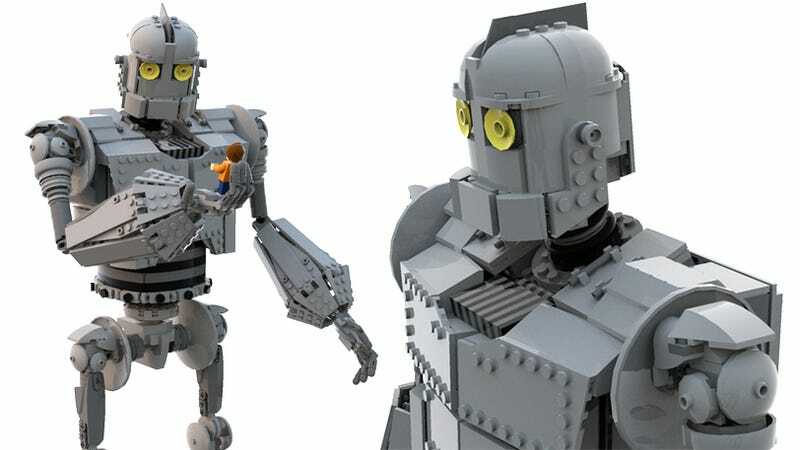 In addition to a fully-articulated version of the Iron Giant itself, Brett’s proposed 2,000+ piece set would also come with Lego minifig versions of the human characters in the film including Hogarth Hughes, Annie Hughes, Kent Mansle, and Dean McCoppin. In order for Lego to seriously consider putting this set into production, Brett’s Lego Ideas project needs to hit 10,000 supporters, and with almost 600 days left, he’s already at 1,000. So if you want one, you’re going to have to convince your friends, and your friend’s friends, to head on over to the Lego Ideas site and pledge your support.